Catboats are adorable, playful creatures, sort of like their feline counterparts. The little ones have a perky sheer line and are as cute as kittens. Who can resist being seduced by the 12-foot Beetle Cat ghosting through a mooring field in a zephyr or nosed onto a beach for a picnic ashore? The big catboats lure us into their lair with a strong sheer line, maybe a bit of tumblehome in the stem, a relatively low and flat transom, and a gracefully curved cockpit coaming emerging from a trunk cabin of equal grace. From a distance, the large models, say 22 to 25 feet, seem as friendly as a Beetle, but up close the size of the spars and massive spread of sail may intimidate the faint of heart. Truth is, all catboats have claws, and the only way to keep from being scratched is to understand their idiosyncrasies. The moniker catboat embraces a variety of models, each having a single mast stepped as close to the stem as possible. 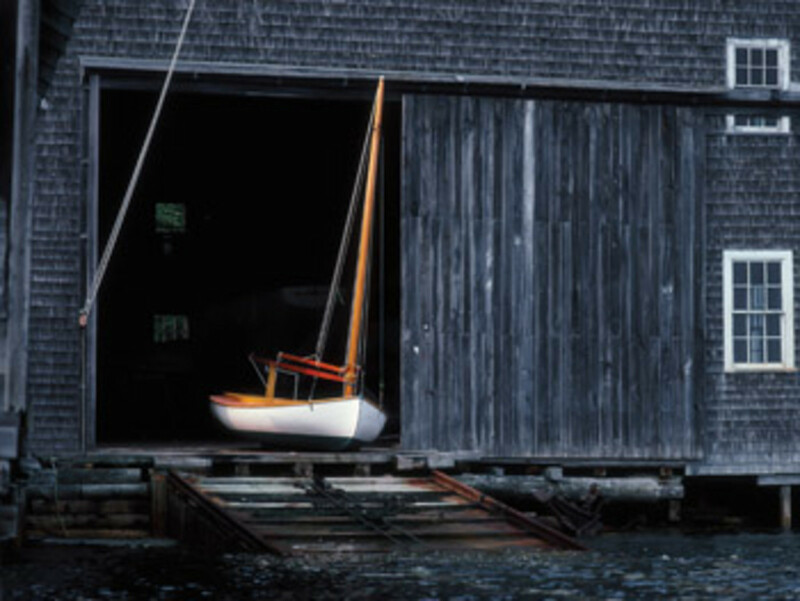 Traditional catboats — derived from the mid-19th century workboats of Cape Cod, New York Bay and lower Narragansett Bay in the Northeast — have a gaff-head sail laced to the mast by rope or set on hoops. This archaic rigging creates space between the luff and the mast, letting the sail assume a beneficial aerodynamic shape and dodge some of the mast’s interference with airflow. The foot of the sail may be loose, fastened to the boom only at the tack and clew, or laced to the boom with line over its entire length. These boats are wide for their length, typically having a beam that measures half the length of the waterline. A large centerboard located roughly amidships provides most of the lateral resistance, but it gets help from a skeg that extends aft to the transom at the same depth as the outboard barn-door rudder. This rudder earned its name by being very long fore and aft, and it also contributes to lateral resistance. 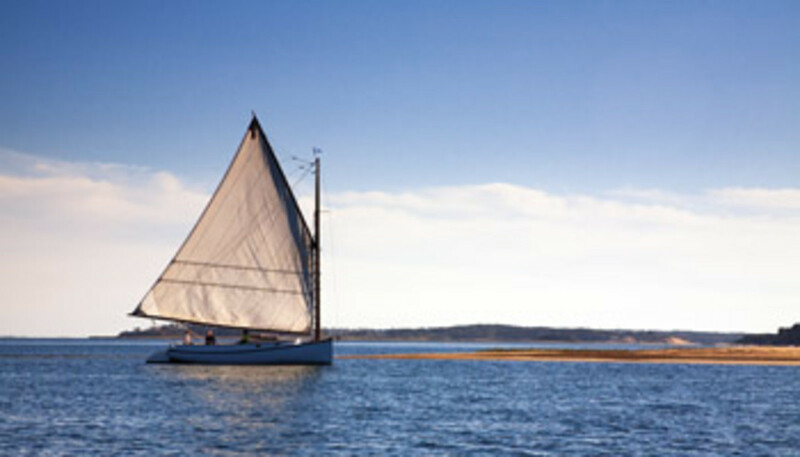 Some catboats have a counter stern and an under-hung rudder attached to the skeg, fine examples of which were designed and built for Barnegat Bay in New Jersey and Great South Bay on the south shore of New York’s Long Island. 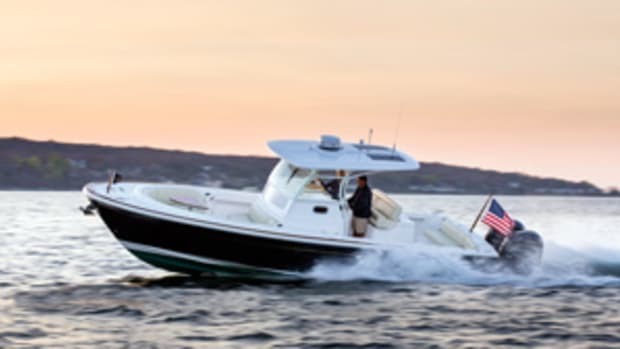 Boats designed and built for use on Rhode Island’s lower Narragansett Bay (sometimes referred to as Newport boats) have a full keel, which gradually slopes downward from the stem to maximum depth at the transom. Iris, designed by Nathanael G. Herreshoff and built at his yard in Bristol, Rhode Island, in 1889, is a catboat only in her rig. Her narrow beam and deep draft are in keeping with keel sloops of the day. She was designed purely for recreation, as were the other Newport boats, and has no connection — other than the rig — with the working catboats. Shoal-draft centerboard catboats based on the typical Cape Cod model of workboat appeared on the bay later in the 19th century. Catboats originally earned their keep as fishing boats. On New York Bay, the type evolved from sloop-rigged workboats. In the summer, when winds were fairly light, these sloops carried a large gaff mainsail and a jib tacked to a long, drooping (hogged) bowsprit. During the winter and its less predictable winds and sea conditions, owners removed the bowsprit, uncovering a second mast hole nearer the eyes of the boat, and stepped the mast there. This single-sail, or cat-rigged, boat was easier to handle and safer in a blow. Racing eventually morphed the New York working sloops into the overcanvassed sandbaggers of 20 to 26 feet that were built to be raced by full-time crews of burly men who moved the sandbag ballast to the windward side on every tack. 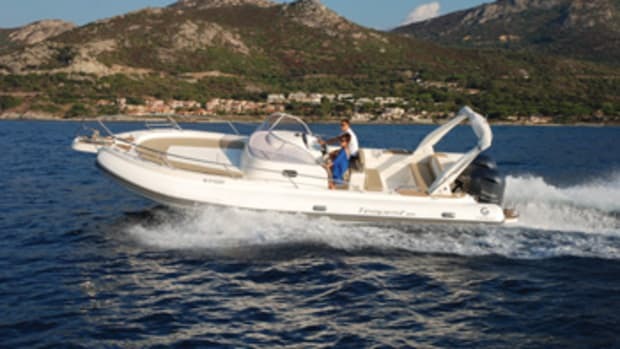 These boats had a steeper deadrise amidships and lower freeboard over their entire length than the working boats. A lot of money changed hands in the betting that spiced regattas. As daysailing and racing became more popular all along the Eastern Seaboard, yachtsmen began to notice the advantage of the catboat’s single sail, its handiness in tacks and windward speed. All of the working catboats carried gaff sails of reasonable size. Although the boom stretched beyond the transom, it was a modest distance, but the rigs of recreational catboats grew as yachtsmen looked for a competitive advantage over one another. Lengthening the boom and raising the peak of the gaff-head sail gained the additional sail area needed, but each “improvement” challenged the owner, demanding more knowledge and skill to get the most out of the boat. Cape Cod most often precedes the term catboat, mostly because of the Crosby family of Osterville, Massachusetts, on the south shore of the Cape. Historian W.P. Stephens in his book Traditions and Memories of American Yachting says ship’s carpenter Andrew Crosby settled in Osterville sometime before 1850. 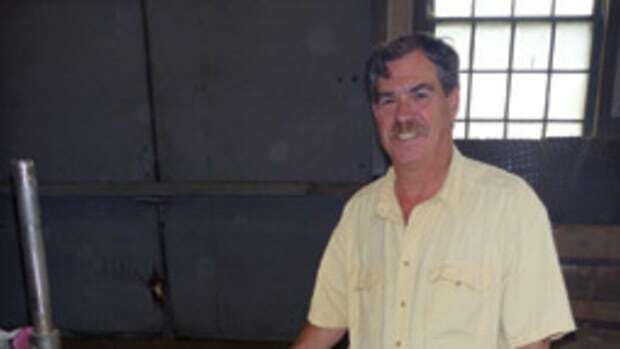 He and his wife, known as Aunt Theresa, had two sons, Worthington and Horace. “Acting under the inspiration of their mother, who was a Spiritualist, after the death of their father, the Crosby boys started to build a boat of an entirely new type: very wide, with plumb stem and plumb square transom and one mast stepped as far forward as possible,” Stephens wrote. 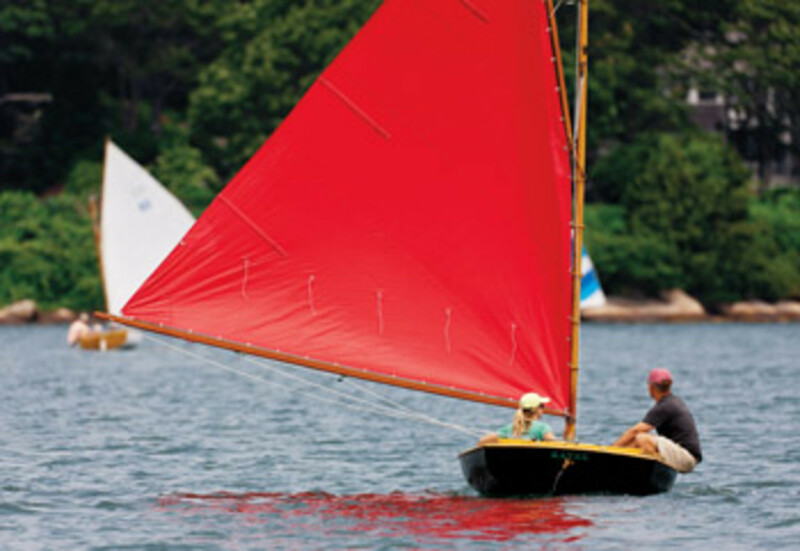 This first of many catboats built by members of the Crosby family well into the 20th century was 14 feet. Her launching attracted fishermen from all along the coast, each of whom wanted to test the new boat’s speed and seakeeping ability in the rough waters of the infamous Chatham Bar. 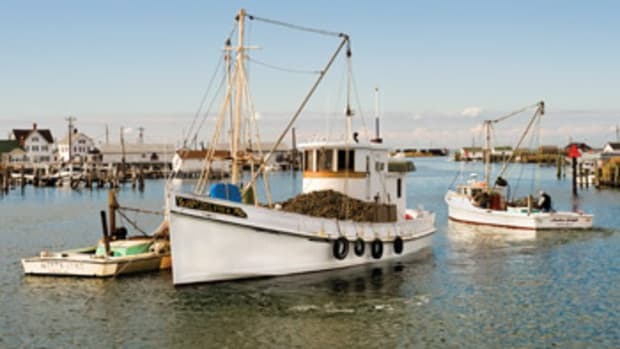 The proliferation of Cape Cod catboats that followed confirms the first boat’s success. In addition to the Crosbys, builder C.C. 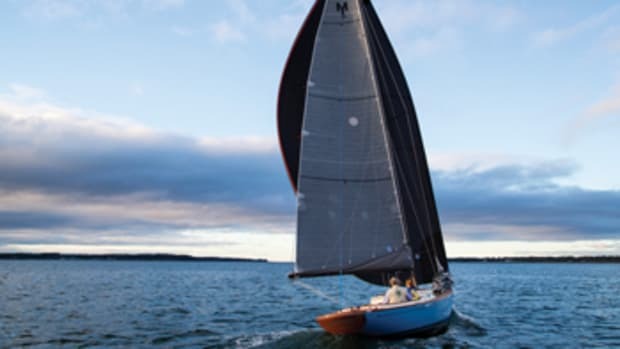 Hanley, also from the Barnstable/Osterville area, contributed a great deal to the growing popularity of catboats designed and built purely for pleasure — and racing. 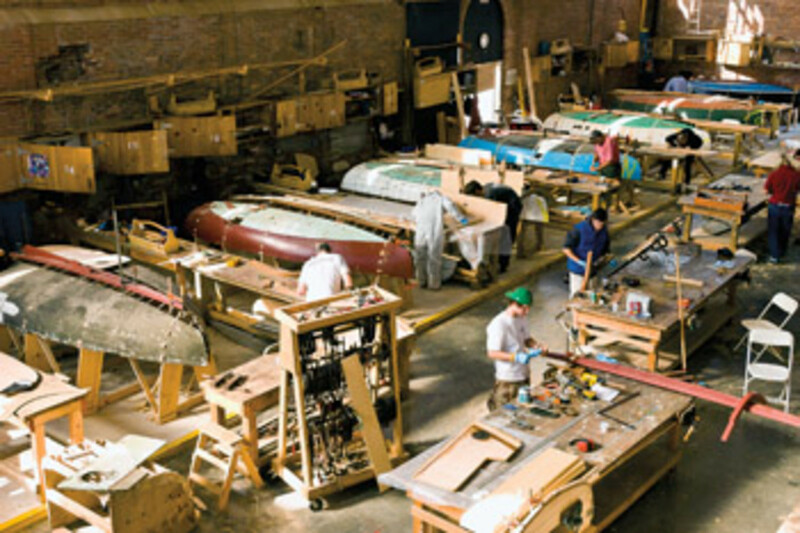 Today, most of the catboats in production share their basic design characteristics with the working and pleasure boats of the late 19th century. Although the deadrise amidships varies, it averages 10 to 12 degrees. The wide beam, firm turn of the bilge, and ballast give these boats an enormous amount of lateral stability, at rest and under way, which makes them feel larger and safer to folks who aren’t comfortable with the heel angles of 15 to 20 degrees common to narrower sailboats. Traditional catboats are also remarkably roomy. You can carry a village in the cockpit of many 25-footers. Interior volume is good, too, but the huge centerboard trunk bisects the space. 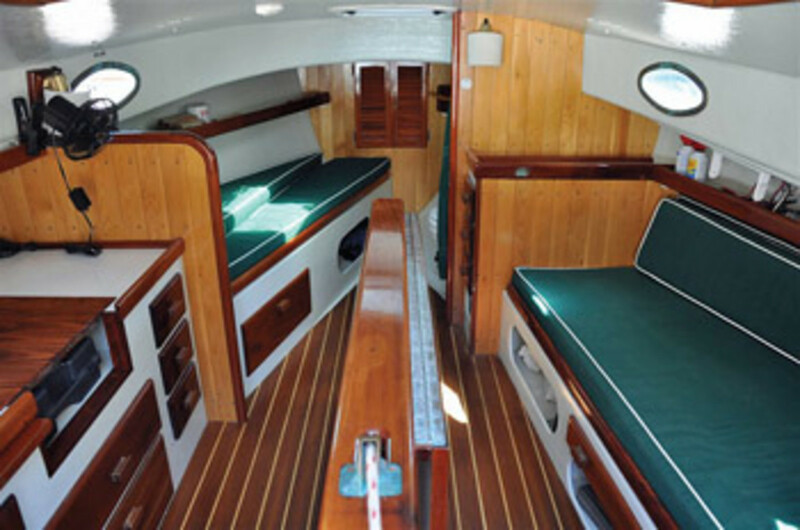 In the interest of aesthetics, the trunk cabin of most catboats is low. That, coupled with the shallow deadrise, limits headroom below. Aficionados of the type apparently don’t care about the compromises. Nor do they mourn the intricacies of adjusting the shape of the sail and managing the weight distribution for optimum performance. 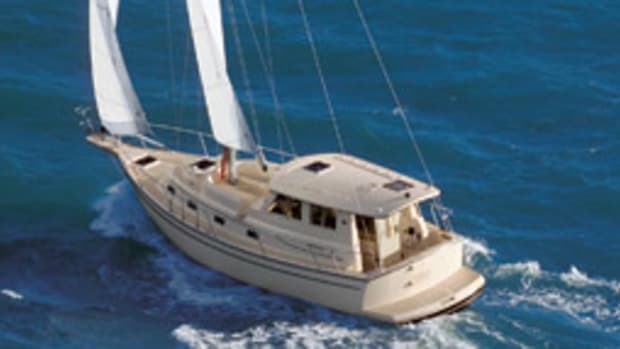 Many catboat buyers no doubt select the type because it allegedly has only the mainsheet to tend. I’ve seen advertisements that hype the simplicity of tacking the single sail, but I’ve never read an ad that talks about jibing. A cloud of sail and massive boom rushing over the cockpit can be a frightening experience to the uninitiated helmsman. Jibing a catboat of 12 to 14 feet is not intimidating, especially in light air, but caution is the better part of valor when the winds pass 10 knots. The most remarkable thing about catboats is their ability to tolerate imperfect technique, as long as you confine your sailing to moderate winds and seas. If you never master the many subtle adjustments the gaff rig allows, you must understand and master reefing. This skill will save your bacon more often than not. One line to tend is a very attractive reason for buying a catboat. You’ll likely have more fun messing about in a casually sailed catboat than you’d have in most types of comparable length. I’ll wager, though, that you’ll first become smitten by the boat’s inherent charm and good looks and feel inspired to discover how to get the most from her.